Don't worry; we aren't getting all political or taking things to seriously here on the site. But I thought it'd be good to at least mention something about Dr. Martin Luther King Jr today. There may never be someone quite like him ever again if things keep going the way they are going. There's not many preachers, politicians, or public speakers that you would say they are willing to die for what they believed in. Most are bought and paid for nowadays. So, I'm a big fan of MixTapeShow.net and 2 years ago; they created an audio version of Dr Martin Luthers King's "The Drum Major Instinct" speech and put some good audio in the background. The speech was given on February 4th, 1968 and he was assassinated EXACTLY 2 months later. It can be a little eerie considering, in the speech, he mentions what should be said about him apon his passing. No one can give a speech quite like MLK could. He has so much more passion than people nowadays. Pay your respects and check out the speech below. 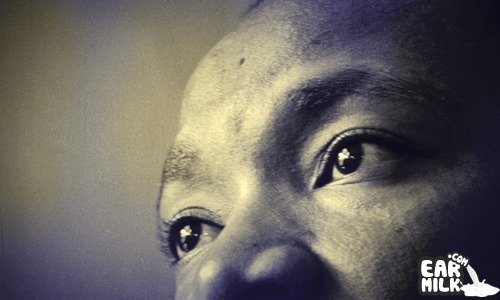 Words: Dr. Martin Luther King, Jr – The Drum Major Instinct Sermon. Delivered 4th February, 1968. 0'35 – Jay Electronica – The D.O.C. Song (loop). This is really just a loop taken from the beginning of Jay's song by the same name. Not sure what the title of the cut means. 2'58 – P Dukes – Brown Leaves. 5'40 – J Dilla – Anti-American Graffiti (Reprise). Kinda hard to do one of these without the D on here. 6'45 – Suburb – Jazz on Acid. 9'00 – Kenny Keys – Set 'em Up. Mean cut. 10'40 – Madlib – Old Age (loop). 11'45 – Ayatollah – Listen. 13'40 – Madlib – Pyramids (Changes). If you don't already own everything that Madlib has put out, you should probably get started now. Stones Throw is a label worth supporting. 15'30 – Suburb – synth+strings. Do yourself a favor and make sure that you listen until the end. This track above features excerpts from Dr. King's very last speech. I had never listened to a speech from MLK before, but to set it to music makes it all the more powerful, especially to a young crowd.